Students can choose from 31 majors and 22 areas of concentration. View full list here. The student-to-faculty ratio is 9:1. 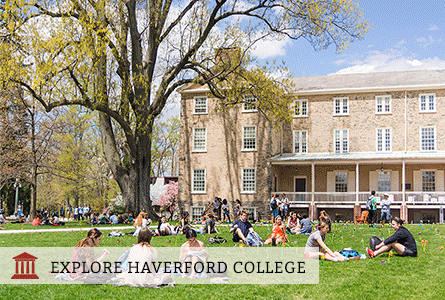 Haverford is one of the very few institutions at which every student will produce a senior year thesis or project. This capstone academic experience offers students the chance to develop and execute their own original scholarly work. Students can receive up to $10,000 in research support through Haverford's academic centers: The Koshland Integrated Natural Sciences Center, The Hurford Center for the Arts and Humanities, and The Center for Peace and Global Citizenship. Through the Quaker Consortium, students are allowed to take courses at participating neighboring colleges: Bryn Mawr College, Swarthmore College, and University of Pennsylvania. Advising is available to students interested in pre-law or pre-health. 50% of students study abroad at some point during their 4 years. 70% of alumni attend graduate school within five years.